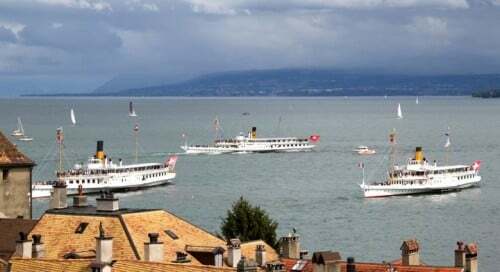 CGN’s fleet of Belle Époque paddle steamboats may be seen at the annual Parade Navale on Lac Léman when all the historic ships meet up for a spectacular parade. The rest of the year these elegant boats cruise Lake Geneva on pleasure excursions. Historic belle époque paddle steamboats cruise daily on Lake Geneva. 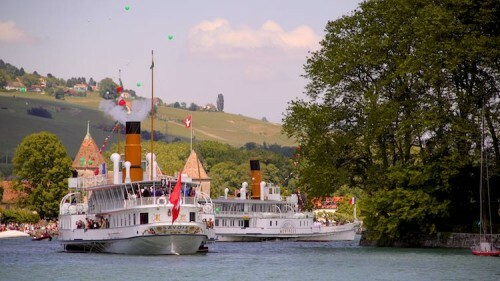 CGN currently has five working paddle steamers and two further electric powered paddle boats, which first entered service between 1904 and 1927, sailing on Lac Léman in Switzerland and France. Once a year, all paddle steamers gather together at the same venue for the Parade Navale display. This naval parade is held Pentecost Sunday in May but the venue shifts annually between the ports used by Lake Geneva pleasure boats. 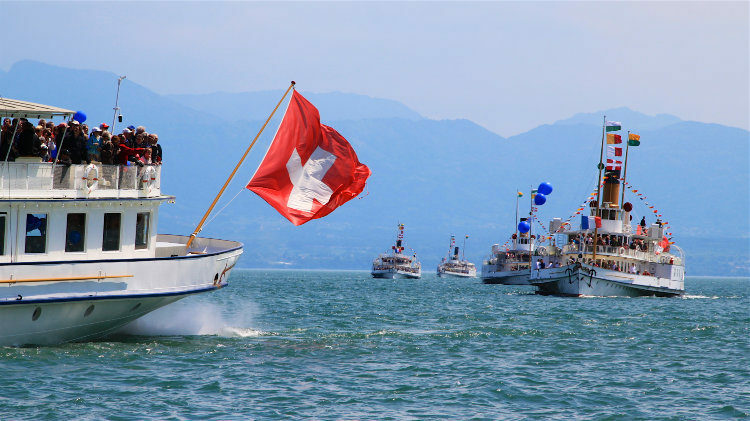 In 2018, the Parade Navale is in Evian on Sunday 20 May. 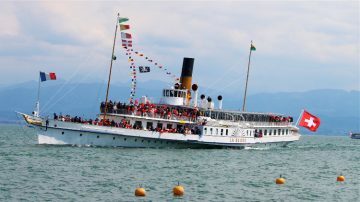 CGN operates a fleet of Belle Époque paddle steamboats on regular pleasure cruises on Lac Léman in Switzerland and France. Revealing their pre-1930s historic origins, these boats offer two classes of service: First Class passengers use the upper decks with best views and smartest saloons while Second Class passengers are on the lower decks with smaller outdoor areas. These elegant, graceful boats offer sightseeing, lunch, and dinner cruises from Geneva, Lausanne, Evian, and many further ports on the lake. Food and drink are available on all boats and usually optional to the ticket fare. CGN’s fleet of paddle steamers include seven boats in daily use and a one awaiting restoration. SS La Suisse (1910) – the pride of the fleet. This elegant vessel can accommodate up to 850 passengers and currently sails twice daily between Lausanne and Montreux (Chateau de Chillon). Pick this boat if the schedule allows! SS Simplon (1920) – similar in size to the La Suisse and almost as elegant but with a much larger dining area. The Simplon can accommodate 850 passengers and currently sails between Geneva and Lausanne (and Evian). 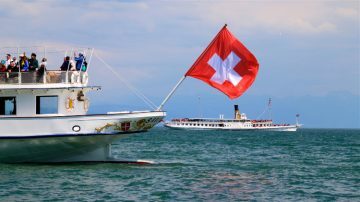 SS Montreux (1904) – the oldest paddle steamer on Lake Geneva. The Montreux can accommodate 560 passengers and currently sails mostly from Lausanne to Montreux and Yvoire. SS Savoie (1914) – similar lines to La Suisse but smaller with space for only 600. The Savoie can accommodate up to 560 and currently sails mostly from Geneva on lunch or dinner cruises and excursions to Yvoire. SS Rhône (1927). The Rhône withdrew from service in 2017. It was the last paddle steamer fully built in Switzerland and is awaiting restoration. MS Vevey (1907) – this Belle Époque boat has covered around 3 million between its launch in 1907 and withdrawal from service in 1910. (It received a diesel-electric engine in the 1950s.) The Vevey returned to service in 2013 after a full restoration and currently cruise year round from Geneva. MS Italie (1908) resumed passenger cruises on Lake Geneva in 2016, after a decade out of service. Like the Vevey its paddles are powered by a diesel-electric engine. For half a century, the Italie crossed the full length of Lake Geneva from Genève to Le Bouveret twice per sailing day and although the new schedule is less exhausting, this beautiful boat will be in active service from Lausanne in winter and all over the lake in summer. MS Helvétie (1926) has been out of service since 2002. It was used as a floating temporary Olympic Museum off Lausanne-Ouchy, while the main museum was under renovation. The Helvétie is awaiting a full restoration and is expected to return to service in time for its centenary. Although it easy to see, or cruise, on one of the historic paddle steamers on Lake Geneva, it is rare to see more than two together. However, once a year, on Pentecost Sunday (usually in May but moving yearly with the dates of Easter) all steamboats come together for CGN’s Parade Navale. The venue changes annually between the ports on Lac Léman. At the Naval Parade, the paddle steamers usually steam by twice close to the lakeshore before all line up to release balloons. Afterwards the boats reverse at impressive speed before returning to their homeports. Viewing the parade from the quays is free and the host port will often erect pavilions and stands, which may be used for free to get a better view. The host port will usually offer free events, free museum entries, and other festival entertainment. 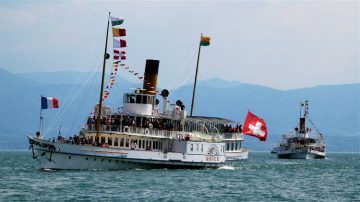 Special cruises on these steamers are offered on the naval parade day from many other ports on Lake Geneva. Reservations are highly advisable while reservations are required for meals on these cruises. CGN has several further motor vessels operating as passenger ferries and pleasure cruise boats. However, as ticket prices are the same for the same distance covered, it is worth scouring the CGN timetables to rather cruise on one of these graceful steamers.